Learning all the sight words in the English language can be a challenging task for beginning readers and finding fun and engaging activities to help them master these phonetically unconventional words can be a chore. 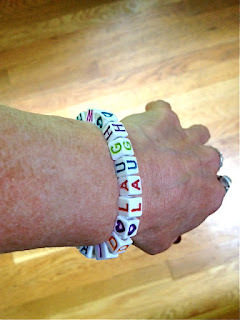 One of my students recently came to a session with a charming bracelet that she had created with the use of letter beads, and it ignited an idea for a fun classroom or home project and game. · Go to the craft store or Amazon.com to purchase letter beads and twine or cord. Personally, I like to use cord that stretches, so that children can easily slip their creations on and off their wrists. I included some links at the bottom of the post. · Make a list of challenging sight words. · Have your student(s) select a challenging sight word and have them place the letter beads onto the cord in a sequence so that they spell the word. You can limit each bracelet to one sight word, or you can do two or more by placing spacers between the words. · Ask each player to wear his or her new sight word bracelet. Make sure each student can read the sight word on his or her own bracelet. · Give each player a piece of paper and a clip board. · Tell the players that they have to read the sight word or sight words off of each student’s wrist. But, so nobody else can hear, they must whisper the answer so only the person wearing the sight word can hear them. If they get it correct, then they get to write it down on their piece of paper. If they don’t get it right, the person wearing that word or words whispers the word back in their ear. They can come back to that person and whisper their sight word again, but not right away. They have to go and read at least two other sight words before they can go back and reread the one that they missed. If there are not any more words for them to read, they must wait one minute before going back and giving it another try. The first person to correctly read and write down all the sight words on everyone’s wrist, including their own, is the winner. If you don't want a "winner," after all the players finish the activity, ask for volunteers to read all the sight words on their paper. If you are only working with one student, you can let them create a sight word necklace with a series of ten or more difficult sight words that are separated with spacers. Encourage them to wear it and see if they can read and spell all the sight words for their friends and family members. I hope you enjoy this activity! I'd love to hear your thoughts! !